Pixi Beauty is a cruelty free brand that focuses on innovative formulas infused with botanicals and beneficial ingredients! The founder, Petra Strand, is also a busy mom so she knows the benefits of multitasking and quick to use products that work! These lipsticks feature a really unique applicator that is meant to provide an even and precise application. And, this formula is supposed to a really comfortable matte formula! I'm personally still on the matte lipstick train. I know there has been a big shift to the glossy side; but, honestly, when I'm wearing lipstick out and about there is too much to worry about with non-matte formulas - wind, baby hands, anything. I would totally be that person with lipstick all over their face and have no idea! But, there are some very uncomfortable formulas so I was excited to hear the reviews on this formula! I was really intrigued with the applicator as well - I like that this is meant to help this be a multitasking product! To apply, you are supposed to use the point of the applicator to outline the looks then fill in the lips! This is great - 1 product and an easy applicator to do everything! I thought the applicator applied the lipstick really well and it went on super smooth in one coat after outlining the edges! This worked well. And, the angle of the applicator was really helpful for a full sweep application to cover the lips! Okay, my swatch doesn't show how precise the application tip is (I didn't use it the right way during this swatch!) This formula is AMAZING! You wear it and actually wonder how a liquid lipstick is so comfortable and lasts so long! I wore this all day, ate, drank, had baby hands all over my face - and it wore so well! It was so comfortable and lasted for hours without budging and still looked good at the end of the night! Seriously, this may be a top liquid lipstick formula! 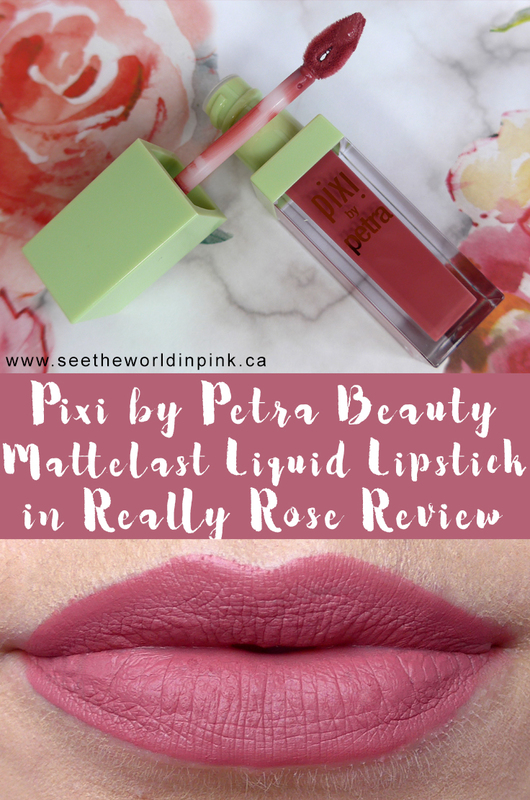 For me, Really Rose is a perfect Your Lips But Better shade - which, over course is my go-to lipstick shade! It takes a lot for me to go far out of my comfort zone! Again, I'm a huge fan of this liquid lipstick formula! I think this shade is my perfect go-to lipstick! I love the application and the wear time of this! Basically, everything about this is perfect for me! I know $20 is not cheap for a drugstore lipstick; but, I actually think it is so worth it for this formula! I will be going back to my local Shoppers and picking up another shade for sure! Have you guys tried this formula yet? This sounds like a great formula! I should have picked one of these instead of the other product I got - which I'll post about before the end of the month! This colour is perfect for you! And totally a colour I'd go for myself. I'm super happy with the formula! It's so comfortable! Thanks so much! Such a good lipstick!